If you’re like me, you’ve probably seen January fly by and feel like New Years was already a million years ago. The beginning of the year is always overrun by excitement, strategy and vigor with tech marketing companies running at full speed, trying to keep up with their resolutions. Maybe during that time you were able to dive into our newly-released 2019 State of the Industry Report: Marketing Trends in B2B Software & Technology and maybe you weren’t (no judging here!). So to make sure you don’t miss out, we’ll highlight some key takeaways to keep you in the loop. 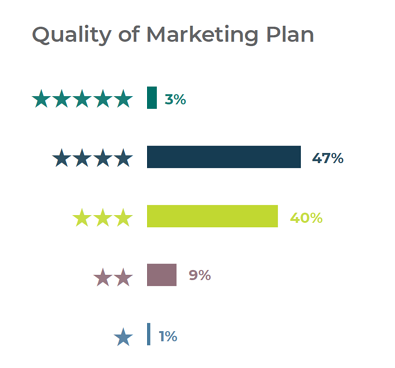 5) Marketers are their own worst critics. This could speak to the ever-evolving trends in the industry more than someone’s actual capabilities. The moment a new trend emerges (Chatbots! AI! ASMR! ), savvy tech marketers are expected to lead the charge. The addition of more and more tactics to generate leads and nurture audiences adds up and few are falling to the wayside. Feel like you’re spreading yourself thin? Slow down and take a peek at our blog 3 Steps to Make Your Tech Marketing Plan Unstoppable in 2019. 4) Limited Tools/Resources are the #1 Challenge. This isn’t surprising, considering that over 50% of respondents work with a marketing team of three or fewer full-time employees regardless of company size. However, time constraints coming in at the 2nd biggest challenge makes things worse. How’s a tech marketing genius to get anything done? Check out HubSpot’s list of best marketing tools for 2019, which includes 60+ apps ranging from marketing automation to data reporting to help boost your efforts. Who knows…You may even finally have time to grab that second cup of coffee (or even read our full report)! 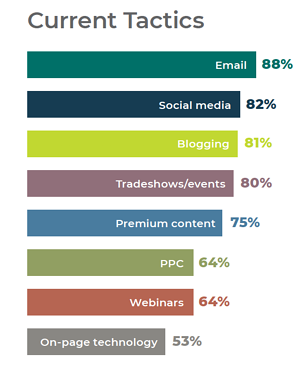 3) 62% of tech marketers are still going it alone. 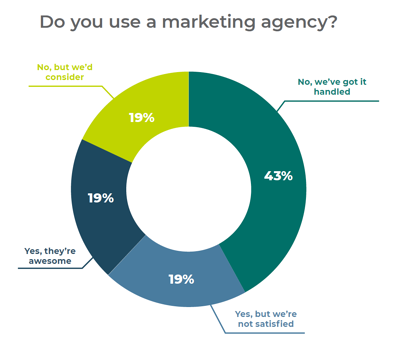 Half of the 38% of those who do use an agency were not satisfied with the current relationship. 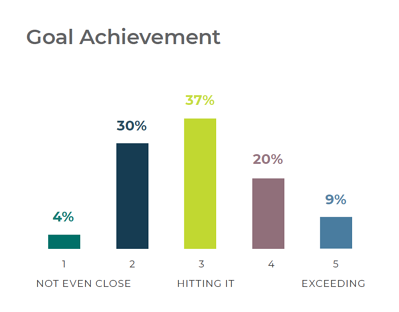 When it comes to partnering with an agency, B2B tech and software companies have a harder time than marketers in other industries. The tech and software industry is complicated and ever changing, making it more difficult for marketing execs to trust outsiders will “get” what they do and who they are as a company. That being said, there are some unicorn B2B tech and software marketing agencies out there and we like to consider ourselves one of those magnificent beasts. 2) Marketers know the importance of the user experience. While it may not be their top focus for 2019, tech marketers are adding company website redesign to their list of to-dos. Over 65% of survey respondents confirmed their B2B tech websites are less than 2 years old, but 60% think their site is due for a refresh. Additions such as video and chatbots can take company websites to a whole new level by heightening the user experience, making it easier for visitors and potential leads to interact with your brand. And, of course, updating page content for SEO changes and new Google rules doesn’t hurt either. 1) Quality content is still king. Out of the rankings of current lead generation tactics, 4 out of the top 5 were primarily content-based. From emails to blogging, every “touch” your company produces should attract, engage or delight (or any combo of the 3) and the pressure to create mounds of it is intense. However, when it comes to all forms of content, marketers admitted frequency was a constant problem. Coincidently, a majority of participants answered that if they could hire an addition to their internal team, it would be a writer who can think both creatively and strategically to produce consistent, compelling content. 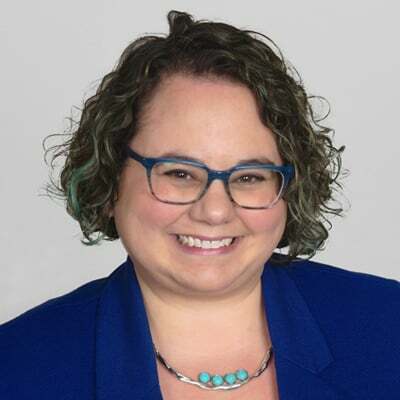 To keep up, B2B technology and software marketing teams are going to need to engage a dedicated individual (or an insanely knowledgeable agency) who knows the industry and can connect with their audience. Ultimately, B2B technology and software marketers are driven, trend-savvy, do-it-yourselfers who believe they can always do better. They yearn for quality tools and resources so they can get to where they want to be and aren’t afraid of new marketing trends as long as they have the support they need. So if you haven’t done so yet, add downloading our report to your resolutions list and take a deep breath. Here’s to making 2019 another killer year for marketing.